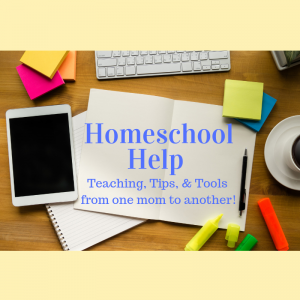 Homeschooling is a big job, and we can all use some help. In over 20 years of homeschooling my six children, I’ve learned a few things that I’d love to share with you. This collection features a variety of teachings, tips, and tools from my own experience as a homeschool mom of six for over 20 years. Spending time evaluating your homeschool year offers benefits to your whole family! It can help you avoid common pitfalls of homeschooling (winter blahs, burnout, lack of confidence, and disempowerment), save your budget, and offer you and your family peace and joy as you go through your homeschool days. Knowing you have given careful consideration to the unique needs and goals of your homeschool allows you to stop worrying and be more productive and restful in your choices. 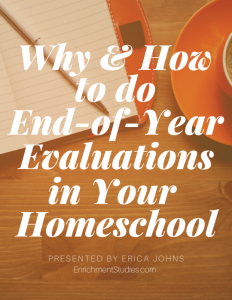 Veteran homeschool mom Erica Johns shares a 30+ minute video session teaching you why and how to do an end-of-year evaluation of your homeschool that will help you move forward with wisdom and confidence. You’ll get access to the teaching video and a downloadable workbook so you’ll be ready and able to put what you’ve learned into practice right away!